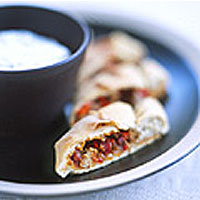 To make larger pies (empanadas), roll discs of pastry to 20cm diameter, add the filling and fold over. Cook at 180C/gas 4 for 30-35 minutes. Heat the oil in a large frying pan and gently fry the garlic, onion and pepper until soft. Push to one side and fry the chorizo or bacon in the same pan until the fat runs. Add the pork and fry until it begins to colour. Sprinkle with oregano and paprika, season and stir everything together for a moment. Add the wine and let it bubble, cover loosely and simmer till most of the liquid has evaporated and the meat is tender. Check the seasoning. Set aside while you make the pastry. Sieve the flour and salt into a bowl, and make a well in the middle. Mix the oil and wine with the boiling water. Pour the liquid into the flour. Mix into a soft dough, then knead until smooth. Tip onto a floured board, form into a roll and cut into 20 pieces. Knead each piece into a ball and then roll into a disc about 12cm across - this elastic dough, which is best worked warm, can be rolled very thinly. Drop a spoonful of the filling onto one side of each disc, wet the edges and fold over to enclose. Seal the edges with a fork. Put on 1 or 2 oiled baking sheets and bake for 10- 15 minutes, until golden and crisp. Serve with a yoghurt and mint dip.